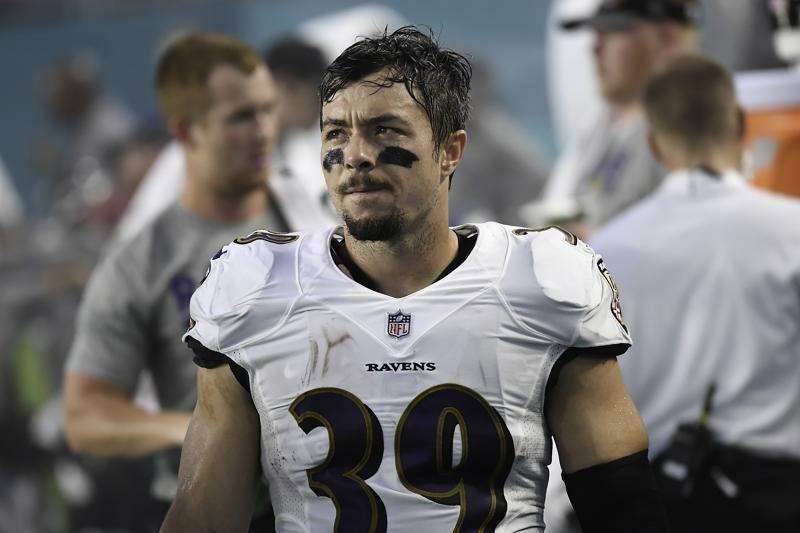 Danny Woodhead’s time with the Baltimore Ravens has come to a close. Woodhead, 33, was signed by the Baltimore Ravens last year to give Joe Flacco a pass-catching weapon out of the backfield. The Ravens had high hopes for Woodhead, and it seemed he would live up to them early in the season. In just the first drive of the Ravens’ NFL season, Woodhead touched the ball four times. Once on the ground for four yards, and three times through the air for 33 yards. Unfortunately, Woodhead injured his hamstring and missed two months of football. He returned in November when the Ravens took on the Green Bay Packers. While Woodhead remained absent, the Ravens opted to run a two back system, highlighting Alex Collins and Javorius “Buck” Allen. The move to cut Danny Woodhead is no shock. Many, including myself, expected the Ravens to release Woodhead this offseason. The move frees up $1.75 million of desperately needed cap space. With the Ravens tight on money, and needing to focus on other needs, the team could no longer afford to keep Woodhead. Woodhead also has an extensive injury history as well. Keeping him after he missed half the year with a hamstring injury would not make much sense for Baltimore. The Ravens have plenty of depth at running back now with Alex Collins and Javorius Allen, and they could add another young back in the later rounds of the draft as well. During his time on the field, Danny Woodhead played well for the Baltimore Ravens. However, it was his time off the field that hurt him the most. The Ravens simply cannot afford to continue on with his contract. Woodhead is simply a player the Ravens don’t need anymore. The Ravens have their lead and secondary backs in Alex Collins and Buck Allen respectively. The #Ravens are releasing RB Danny Woodhead, source said, for cap reasons. A gritty dude hits the market and is up for another payday. Releases of Howard ($3M) & Woodhead ($1.8M) creates a net Cap savings of ~$3.8M after Rule Of 51 offsets. Ravens talked about pay alteration for Woodhead. But couldn't agree to new deal. Door is now closed, but Woodhead hits free agent market. Release saves Ravens $1.75 million. Ravens will probably draft a RB, but have Alex Collins and Buck Allen and Kenneth Dixon returning. Next Next post: Baltimore Ravens to sign John Brown.